The house includes a living room, a kitchen and a toilet on the ground floor and three bedrooms (sleeping a total of 7 guests) on the first floor, including two bedrooms with king beds and a bedroom with a bunk bed for a total of three. Two bathrooms all with showers complete arrangements on the first floor. Beautiful views of the sea can be found from any of the terraces of this three bedroom house or its solarium. Dishwasher, microwave, table and silverware, cookware are all available as is a washing machine for your laundry needs. The house is equipped with telephone, DSL-Internet, televisions in living room and bedrooms, air-conditioning and heating during winter months. Private parking is to be found at both street level (50 step staircase to the house) or, through a ramp, directly at house level for easy access for all guests. This is a great home for vacations by families or friends. Villa Rotonda is positioned off the beaten track nestled amidst thick Mediterranean vegetation surrounding the entire property. This position assures privacy, silence and a cool constant climate year-round. The property has an ample park including pine orchards, gardens, fruit orchard (depending on season apples, pears, figs, prickly pears, prunes, apricots are available to guests) all along a terraced land overlooking the house and the sea. The park includes a pool for use by guests. This is a great home for vacations by families or friends. With 3 bedrooms and 3 bathrooms this home offers all comforts. If you like casual living, great views, a clear blue sea, dining al fresco, and if you want to offer your kids plenty of space to play outdoors, look no further. Beautiful views of the sea can be found from any of the terraces of this three bedroom house, while the solarium on the terrace of the house has breathtaking unimpaired views all the way to Tuscany, Corsica and Capraia. All these outdoor areas are perfect for basking in the sun, relaxing under the shade of a tree, sipping a drink while enjoying a sunset with the backdrop of the sea and close-by islands. Private parking is to be found at both street level (50 step staircase to the house) or, through a ramp, directly at house level for easy access to all guests. All areas around the house and park are illuminated and easily accessible also at night time. The nearest beaches 'San Andrea' and 'Cotoncello' are about a 7 to 10 minute walk. Both have sandy stretches and cliffs suitable for sunbathing and diving. Careful when diving as presence of rocks and sea urchins can make it a painful experience. Waters are crystal clear and ideal for swimming and snorkelling. San Andrea Beach provides all food, amenities like umbrellas and beds and sports activities you may ask for. Cycling, kayak, water skiing, diving are just a reminder of an active life. Hiking is recommended in the surrounding areas. Trails take you to Madonna del Monte or for a whole-day experience to Monte Capanne and to Marciana Marina. All are wonderful, impressive experiences. Even at high temperatures exploring the great chestnut forests is a refreshing delight. With a little luck you can even see wild boar or Muflon. The scent of rosemary and lemon accompanies you home and every corner can suddenly open a scenic view towards the sea. The nearest shops and restaurants are in Zanca or Sant'Andrea. Marciana or Marciana Marina are easily reachable by car within a 10 to 15 minute scenic drive. We enjoyed a week exploring the Western end of Elba. Visited local towns, markets, cable cars up mountains, hired boats and loved snorkelling in the sea both off beaches within walking distance, and on a wreck close to shore a few miles away. Lots of nice places to eat in Sant'Andrea, a particular favourite of ours was Il Gabbiano - fresh seafood, friendly staff, fantastic beach side view, appropriately priced. Helpful and friendly owner showed us the house upon arrival. Very clean place. We enjoyed our stay very much. The house is located on the north-west part of the isle, surrounded by trees, with magnificent view on the sea. Two beaches are accessible after a 10-15 minute walk on land a bit steep, but fairly easily accessible. A lot of lovely beaches are also accessible by car. The house is very well organized and has everything you need for a life with family and friends. The owners are extremely courteous and available for every need (Angelo is a true angel!). I would warmly recommend this location. great house, great location, splendid small little beaches around within walking distance from the house. We stayed with a 2 years small child and it was just an ideal family vacation. Finally the hosts were very welcoming and friendly. Villa Rotonda is located in Cotoncello directly overlooking the beautiful town of Sant’Andrea and Capo S.Andrea, in the north-west of the island of Elba home to Napoleon in his exile. Better known as “The island within the island”, San Andrea is a preciously preserved part of the Island of Elba completely within the boundaries of the Tuscan Archipelago State Marine Park where nature is wild and the climate is mild. This part of the world boasts incredible fauna and flora making it a natural destination for nature lovers and for those looking for peace and relaxation. The green of the Mediterranean vegetation, the deep blue of the sea and the rugged granite cliffs make it a land of contrast and breathtaking views. 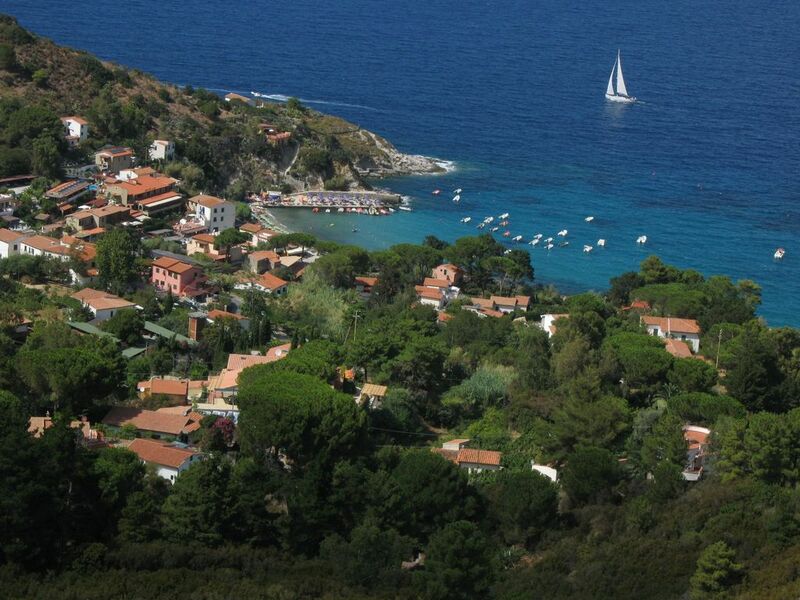 Nearby some of the most beautiful and well known attractions in Elba including Marciana, Marciana Marina and Poggio. Breathtaking views of Tuscany, Corsica and Capraia. A deposit is required as confirmation of rental reservation and all dues to be paid prior arrival. Payments made directly to owner through bank transfer. A security deposit, returned after departure form the property, is required covering possible damages to house and pertinencies. House cleaning fee is Eur. 100. For guests with pets, house cleaning fee is Eur. 150.